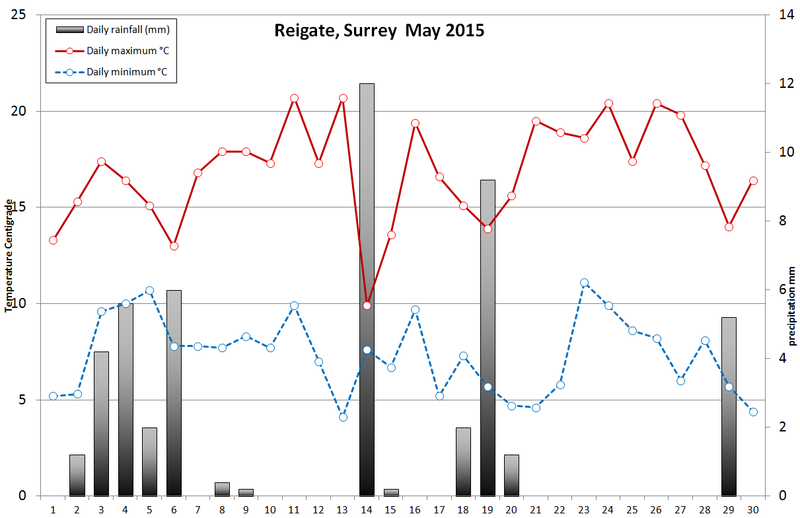 At 12C the May average temperature in Reigate was a tad cooler than long term average, as it was for the whole of the UK at a mere 9.6C, (0.4C below the long term average for the SE). May was the first month since August 2014 to be below CET long term average. 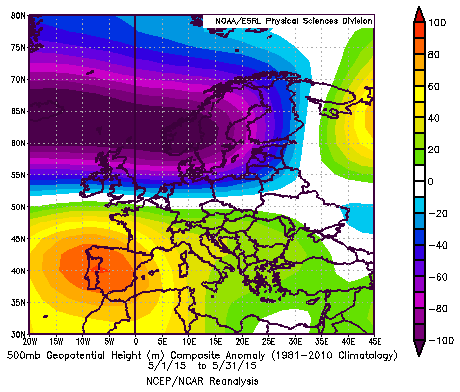 The chart below shows the mean monthly 500mb geopotential height for May and shows a big LOW to the NW of the UK. This pattern would generally cause a cooler than average W/NW flow across the UK, especially the northern part of the country. The culprit causing the slightly cool / unsettled May was a LOW pressure in the Atlantic to the N/NW of the UK that caused a NW airflow which also reduced sunshine hours below average, at 161 hours. May rainfall in Reigate was 53mm. Frontal rainfall from occluding Atlantic LOWS brought rain early in the month when it was quite windy too, with max gusts over 35mph on May 6-7. Sunshine totals were low during the first half of the month but picked up mid month and later. 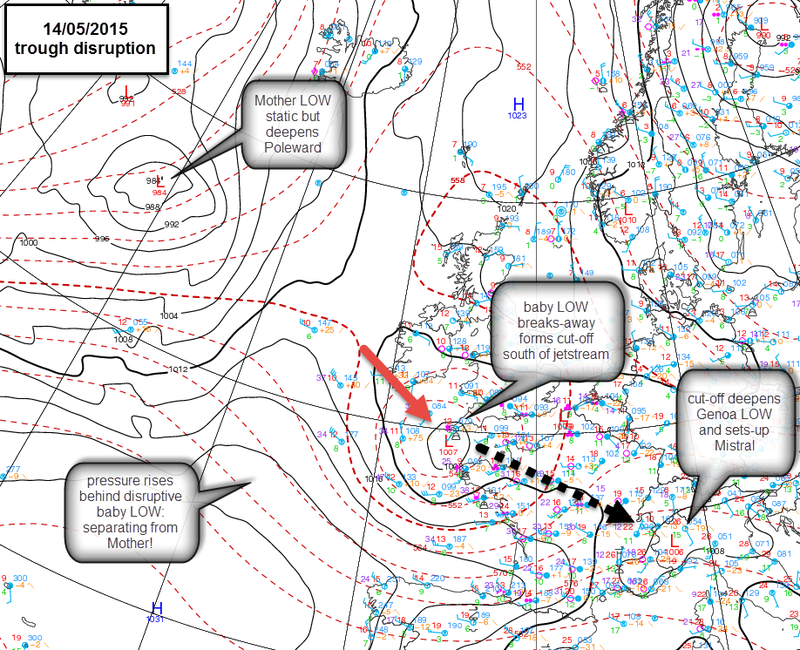 A trough disruption May 13-15 caused a particularly wet 24 hours 13-14 May. Trough disruptions are notorious for causing unpredictable weather events, including causing poor model forecasts for rainfall. The charts below show the trough disruption progress. 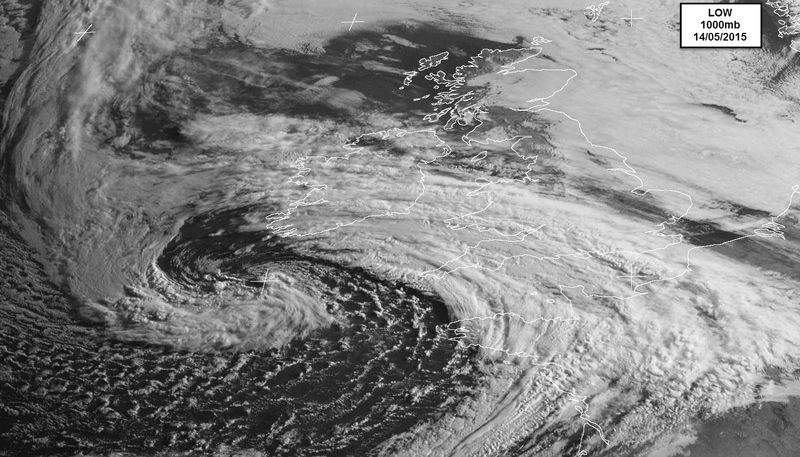 The satellite picture below shows the LOW resulting from the disrupted trough and the band of cloud associated with the fronts. In Reigate this single event caused the highest daily rainfall total for May, at over 15mm (CoCoRahs manual rain gauge). A thundery event occurred on 19 May and brought heavy showers across the SE. Here is the synoptic chart for that occasion. Some impressive mammatus clouds were spotted locally as the cumulonimbus clouds moved away.